I can't think of anything encouraging to say. We have managed just four points away from home, we were clearly lucky to win at Doncaster, we failed to score against Forest who had been letting in goals for fun until we rolled into town. If you take away the points we won at Doncaster and at home to Swansea (another game we were a little lucky to win) and if we had played Reading this weekend rather than before they settled back in this division, and lost, we would have 1 point. Watford in forth from bottom have eight points (three from us). We were completely over run for the first twenty minutes of both halves tonight and during that period of the second forty five we conceded the only goal Palace were ever going to need. During the last twenty minutes of the first half we seemed to settle, but we were still playing with ten men behind the ball. Even when Varney (who ran his lungs dry all night) won a ball there was no one within twenty yards for the second ball. It wasn't all long ball stuff, but it wasn't cultured football either. After making such a statement about changing things about Pardew merely dropped Andy Gray for Darren Ambrose. I can understand a defensive approach to an away game, and we nearly kept a clean sheet, but if we were still playing now we wouldn't have scored. That statement would also be true if you are reading this on Wednesday afternoon. If you look at our nine league games and the Yeovil home game we have beaten Reading in a game that could have gone either way, but in which, to be fair, we looked good, but all the other wins could easily have been draws (or defeats) and I don't believe that we were unlucky in any of the games we lost. We had Youga sent off at Watford, but it was nearly half time and we were losing anyway. Week after week I try to justify why we have won just nine of the last 34 league games; why we have not won back to back games since December; and how that can be turned into promotion winning form. We need to win four wins on the bounce while Wolves lose four on the bounce to catch them, and we have only played nine games. We are now four points away from sixth place, and there are ten teams with three points (one win) more than us and it is taking us on average 3.77 games to pick up a win - based on the last 34 games. I think the saddest statistic is that I fear our season so much right now that I was less bothered about losing to Palace than I was about not picking up any points. I know we only need to go on a run and we will climb the table, but Pardew had been promising this for over a year now and we look no nearer to it happening. Is Pardew getting the best out of his squad? Is the squad good enough? If the answer to either of these questions is no (and one of them needs to be) then Pardew has a problem. If he is not getting the best of his squad then would it not be sensible to find someone that can? If the squad is not good enough then is that not Pardew's fault? I know we have had some forced sales this summer but I think Magic and Big Chris are the only two that we might have wanted to keep. We kept ZZ (who to be fair hasn't been fit to play as of yet) and did sign Hudson and Bailey - and Bouazza for Thomas. We have also brought in Craine and Primus. I just don't know what the answer is, but unless Pardew gets it right soon we will have to write off this season as a promotion campaign and settle in for the first season with no parachute payments. The likelihood is that at least one of the three teams that came down last season will not go up so that makes four who will have parachute payments next season. You have to expect Sheff utd to have more money too. If I'm honest I just can't find any justification for Pardew's failure to get us promoted in these two seasons. It could all change against Ipswich on Saturday, but I fear that a defeat will force the board to make a decision. I know we can always storm into the play offs in the last six games of the season, but if we rely on that we are pretty much sticking our heads in the sand. So a poor performance and a defeat against the team I want to beat most in the whole league (probably the world), and back to back defeats for the third time in ten matches. It's no wonder I am feeling a little disappointed right now. Still there is always Saturday, and my sons horrendous run of defeats must end sooner or later. I specifically remember my first game at The Valley was a 1-1 draw. I remember little about the match itself, but I do remember the final score. This is a statistic that will stay with me for life. It's a bit like when you lost your virginity (just after my wedding Mum - honestly) it doesn't matter what it's like, but you always remember the girl and the circumstances. 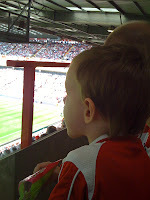 So my son's first game at The Valley was a 2-1 defeat to Sheffield Wednesday. That is, however, only a small part of the story. As the football was a bit rubbish (the result in particular) I will give you a run down of our day - one that I suspect will be remembered better by me than KH Jnr. As I feared that a four year old would struggle to concentrate on 22 men running around a big field I brought along his Mum so that if he got bored she could take him home or buy him some sweets or something. We left a little early as I called the club on the Saturday morning and was advised that I couldn't book a ticket over the phone on a match day. This was a little inconvenient as it meant having a restless child hanging around, but it was necessary to get a ticket close to our seats, or be moved all together. To my surprise, and great satisfaction, the seat next to mine was available - fantastic! With time to spare we walked round to the Fish and Chip shot on Floyd Road for a bite to eat. After eating the chips we went for a walk around the club shop. This was enjoyable enough, but the lack of Ben 10 or Power Rangers toys meant that it was a short visit. The chap had given us the new catalogue on the way in which included a small football. This, it was decided, was what he would have. Great I though as this meant that he would have a nice Charlton memento from his first ever match, Something to show his children (OK I'm getting a bit excited I know). Alas, despite having a lovely new catalogue many of the items in it are not available yet. No worries, as soon as Mummy said that we would stop off on the way home to get a Ben 10 toy we were all happy again. We then wandered over to the East Stand turnstiles. This is, itself, an exercise that needs to be considered. It's a good job there were three of us as once you go though you cannot get back. As silly as it seems, fears of being caught the wrong side of the turnstile to a four year old were quite real. So we were in the ground. I started pointing out the stands etc. but he seemed rather less overwhelmed that I would have thought. I just imagined that he would have been impressed by the huge buildings, but he was not in the least bit interested in them. After a quick 'wee' - little boys (and mine in particular) seem to be able to wee all day long - we made our way to our seats. I had been a little concerned that the sheer number of people present would have caused some nervousness, but not at all. The players came out and I explained (as if I needed to) that we were the players in red and those in blue and white were the other team. I explained the home and away ends and why they seemed to be wearing the same colours as their respective players. The first fifteen minutes seemed to captivate him. He initially decided to stand, but as you can see from the picture my seat was just in front of the barrier. He also had a little spell sitting on my knee. This is quite possibly one of the high points for a Dad. We were still at 0-0 at this point, but everything in the world felt good. Then the Percy Pigs ran out, and his interest in the football started to wane. He started asking if it was time to go home. Mummy (in a way that Dads, especially me, cannot) encouraged him to sit on his seat (my normal seat) and just wait a while. Then we had a free kick, so I suggested to him that we might score a goal here, and he became interested again. The goal was a bit of a tap in so not very exciting, but I jumped up and shouted; he burst into tears. I think the crowd seems very nonthreatening until they all jumped up and shouted very loudly. He was soon calmed down and now that he understood (although clearly not everything) he joined in with a little shout and a jump of his own when Wednesday scored, twice. He was just trying to be like Daddy, but all in all I think he came through his first half very well. Sadly, his interest in watching anymore football had all gone, so Mummy took him over to Charlton Park for the second half. As I'd expected as much and as Mrs KH is about as interested in watching Charlton as I am in watching Songs of Praise she was not bitter at missing the second half. As all children are different I would suggest that other four year olds would have been enthralled with the whole game, but I would have taken one half before I got there, and he says that he wants to go again, so all is not lost. So I am now the very proud Daddy of a fully fledged Charlton Fan, even if he is so sporting that he cheers the other teams goals too. As for the match, I have to confess as to not being as attentive in the first half as I normally am, and the second half was just like a re-run of all those games last season where teams came and put ten men behind the ball. Not being able to break them down is a flaw but not a terrible one. Giving away a lead (something we have already done four times this season - all be it we still went on to win against Reading) is a very worrying sign. In the absence of my dad I decided to go to Palace on my own. I am now beginning to wish I hadn't bought a ticket. I fear that we could well lose that game now, and the fall out for Pardew, who is becoming more and more unpopular with the fans could be significant. Still we have a new fan in the family, and even if it made him cry his first ever goal at a football mach was scored by a Charlton player. Suddenly Luke Varney has been immortalised. It's a big (no huge) day in the Kings Hill household today. Since 1980 there have been two generations of Charlton Supporters in my family - my Dad and me. As from today there will be three. My son who is probably a little young to become hooked immediately (4 years and 140 days - well they do it for footballers why not fans) is coming to his first game at The Valley. Well, it's been a month to the day since he started school and if he has to tolerate the hum drum of getting up early five days a week why shouldn't he get to enjoy the finer things in life. With this in mind I have little (relatively) interest in today's match. All I ask for is a sunny warm day (looking good), an exciting game, some goals, and a win. As my Dad and I have racked up literally thousands of games between us I think that what I am asking for is the least that we deserve. Today Pardew can pick any team he likes, play any formation he likes just as long as we see an exciting game with goals and us scoring most of them. I'm tempted to ask for a repeat of last seasons result against Wednesday, but as my son is likely to get bored and want to leave maybe we'd better get the first two or three goals just in case. So, all I want is an exciting game with us three up in the first ten minutes. Come on Pardew, you took the Hammers to an FA Cup Final, surely you can conjure up three early goals for a little boy who is probably going to throw literally thousands of pounds at the club in the next seventy years? Oh, and just one other little request, could the Covered End Choir keep the swearing down a bit today as his Mum is coming and doesn't really understand the need to discuss the referees sexual preferences, or his lack of a partner, when he gets it wrong. I suddenly feel as though I have been waiting for decades to plagiarise that immortal line I heard when I was a boy. "This, son, is The Valley. The home of football". Well what it means to me maybe a little different from what it means to Alan Pardew. It is true that respect needs to be earned in some circumstances, but in others it should just be given irrespective. The crucial point here is how are we going to make our children respect themselves and others when those people with a much greater access to the press continue to question competence and ability. What would Pardew think if Matt Holland came out and said that the manager was useless; he still has no idea of his best side; he has spent more money than most of the teams he seems unable to beat; and he talks rubbish just about all of the time? I'm guessing that it would be an unpopular move by the man that is arguably our most respected (and probably most respectable) player. If we are going to have an open forum on slagging off professionals (referees are professional) when they make "the wrong decisions" maybe Pardew should be forced surrender his job and waive any compensation for bringing in a load of loan players last season and destroying our promotion challenge; or for any of the other tinkering changes that have been made that were unpopular before, during and after the event. If we are going to show respect to millionaire football managers that are trying to do their best and are making mistakes along the way then maybe we should offer the same to referees. I know a referee personally. He doesn't have anything to do with league games, and doesn't earn anything like the money that league refs do. However, he is a good man, and he does his best to facilitate the huge demand for local football to be refereed. The respect campaign is designed to provide a framework that ensures referees are respected on local parks and in schools. All that Pardew is doing by questioning that campaign is adding fuel to the fire that provides the kind of incidents that drives the 'amateur' referees into giving up. If there is any question of the referees cheating for personal reasons or for financial gain then I have no problem with throwing the book at them. Frankly, due to my love of the game, I would lock them up and throw away the key. Until, however, that is proved we are let's show these guys some respect. We have a lot less press coverage now that we have been relegated, and by definition so does Pardew. For me I would prefer to keep it that way if the only alternative is to come out and make us targets for criticism. I can't help thinking that the more we (Pardew) publicly blames others for our failings the less respect we as a club (and the manager in particular) will have from the football world. I have no doubt that the linesman (I will never call them assistant referees) at Vicarage Road on Saturday did what he though was best. I actually find that kind of thing to be part of the wonder of football. A mistake, an error, a human failing can have an impact in a sporting event that ensures the unpredictability. In a world where we are constantly complaining about the top four being guaranteed blah blah blah it is nice to think that there are still variables that cannot be anticipated that can change results. Even if these things go against your team you can be sure that at some point you will have a decision go in your favour. Watford, for example, benefited from Kelly Youga being sent off when we played there. My own personal view was that Kelly was a little unlucky to be sent off, but that's football. That is one of the reasons why we go to football and Charlton in particular. I don't have a problem with managers pointing out that they believe their result could have been better if the referee had made different decisions. However that old saying about greenhouses and stones comes to mind. I am more than a little fed up with Pardew blaming everything else for our (his) failings. I haven't even mentioned the fact that Forrest were on a terrible run of form, must have been very low on confidence and have serious weaknesses at the back so Pardew plays 4-5-1 and invites them to attack us! As for suggesting a personal witch hunt and following this particular referee's career? Come on Pardew show us all a little respect and start focusing on your job rather than that of a referee who didn't save your blushes when you picked the wrong team. That's what it means to me! It has been a little bit of a stressful week in the Kings Hill Addick household this week. If all the excitement of Lehman Brothers filing for bankruptcy, HBOS falling then being taken over by Lloyds TSB and the Stock Markets going down, down, down then up, up, up Mrs KHA and I were called to KHA Jnr's school to discuss his behaviour. After a lot of effort we chose a school that we thought would be good for him. It's not terribly local, but we were happy to make the sacrifice of 'The School Run' for his education. He is four years and four months old (much too young to be going to school in the first place, if you ask me) but it would seem that he has failed to settle in to this absolutely new way of life in the first three weeks. It would seem that a number of the other children went to the school run nursery, which has helped them to settle in. I know this is hardly about Charlton, but it does focus your mind a little when (please bare in mind that I can be excessively paranoid at times) you suddenly find yourself called in to discuss your off spring. The call went something like this "We need to discuss KHA Jnr's behaviour. I will meet with you tomorrow after school." Needless to say the sleeplessness that night was not because I was thinking about our chances of picking up back to back away wins for the first time in ten months. At the meeting I actually put on a suit, shirt and tie for the first time in ages so that I would look like the kind of Dad that wouldn't have a badly behaved child - why do we do that? It would seem, however, that he is, in fact, a four year old boy - shock horror. The purpose of the meeting (it would seem) was simply a method of keeping us involved. So, basically, I spend a whole evening and half the night worrying and took an afternoon of work so that I could be kept in the picture. I guess that is actually a good thing, but the worry leading up to it did nothing for my health. Anyway, all that stress behind me I started to think ahead to Forrest away. It would seem that we were a little 'lucky' at Doncaster. Pardew's suggestion that we decided to defend and allow them possession sounded like a great plan - after the result. I'm not convinced, to be honest, that that was his plan before the game started, but let's give him the benefit of doubt (again) and assume that we had a plan, stuck to it and came away with a very creditable three points against the type of team we failed to beat last season. In truth the Doncaster game could well be more important than we think - or would like - if we end up at the bottom of the table this season, but we could well still make a challenge for promotion. I think one such test is our ability to win back-to-back games, something we have failed to do since last December. This could well be a problem, but a win today would banish that and provide us with a huge confidence boost. I, as most of my peers, suspect that Pardew will keep an unchanged side. I would like to see Moo2 playing for all the same reasons as Chicago Addick, but I don't think we are going to see him again any time soon, sadly. As for a prediction? Well I think we are going to win. Don't ask me why, I just have this feeling. Before you all run off to the bookies, I am normally wrong, and I am always overly optimistic. Either was it will be nice to be able to sit down in front of Sky Sports News without the worry of having Satan's child in the family. No real shock this. A bit of a disappointment, but not a big surprise. Games often turn on a single incident, and that seemed the case on Saturday. The early goal cannot really be called 'against the run of play' as it came after only three minutes. It changed the whole game. Maybe we had decided that we would sit back and invite the league leaders to come at us again and again before kick off? I'm inclined to think that human nature being what it is the players tended to drop back to defend the lead we may, or may not, have deserved. Wolves looked good. They were clearly the better side. There were several suggestions (from my Dad) that we were 'lucky there'. My answer to that has always been to remind us of the comment that Steve Davis gave in the 1980s when he'd just beaten Jimmy White out of sight to win the World Championship (again). David Vine was trying to appease Jimmy White fans by suggesting that the manor of the result was affected by Steve having a bit of luck at times. His response was that "The more I practice the luckier I get". Let's be fair it is the job of defenders to get in the way of shots, make clearances, perform last minute tackles. Charlton have, for many years, especially under Curbishley, ridden our luck at the back and kept teams out by sheer hard work and organisation. Hudson was part of a Palace team that did that many times last season as well. Having said that I didn't believe that the result was going to finish 1-0. It was, actually, a really good game, but I believed that there were more goals to come - sadly I was right. We have no shame at losing (all be it a home) to Wolves. They are a very strong outfit, and Mick McCarthy clearly knows how to find and sign players. Vokes was a very good player (£300k) and I mentioned last March about the significant contribution Ebanks-Blake provided following his signing last January. However, I would argue that Wolves have no superstars. Keogh looked very dangerous in the latter stages of the game, but that was after Sam had gone and Bouazza was playing on the right. I also thought that Craine looked like the centre half that he says he is. The big thing about Wolves is that they seem to be able to pass the ball very well. This is not because (I don't think) because their players are much more skillful than us, it is because they just seem to know where their team mates are all the time. If you instinctively know where the ball needs to go (i.e. where the player you want to pass to is) you don't need to look up and risk taking that extra second or two before passing. I fear that we will never have a side (and formation) that is settled enough for us to have that benefit all the time Pardew is in charge. I noted from the program that Pardew now believes that he has changed the squad sufficiently that the team can play the way he likes his sides to. I would argue that he has had these players for a while and chose not to play them. I would also suggest that of the players that went out this summer the ones that played a significant number of games since he arrived were signed by Pardew himself - Iwelumo, McCarthy, Bougherra, Thatcher and Powell. Still, I'm willing to give him the benefit of doubt, especially as we do seem to have played the same system in every game this season. I think some of the personnel changes have been unnecessary or just plain wrong, but I am saying this with the benefit of hindsight, so it is a little unfair. The sad truth was that Wolves were better than us on Saturday. I can understand the suggestions that they will be the best team in the league this season, but I'm not sure if that is the case or if it is just wishful thinking. I mean, if Wolves are the best side in the Championship, then we could still be a very good side in this division and look woefully inadequate against them. We have a balanced side now. When he can pick from a fully fit squad, we have the players than can make up a team. Sadly Pardew feels the need to move these players around a little too often for my liking. However, I fear that the reason for this, and the reason that we may well fall short this season, is that even though we have the players required for our style of play, they are on the whole not good enough. I won't pick out specific players, but there is, in my view, not enough quality in certain positions. This will only become more apparent when we start to have injuries and suspensions. There is a growing feeling that the club mislead the season ticket holders on this issue - irrelevant at this point - but it might just affect our match ticket sales if performances and results fall away. We are still only one point behind sixth place, and we have a long, long way to go, but the team needs to gel (again) and some of the players need to raise their game. On the basis of what I have seen so far this season I think we will be seeing less games like Reading, and more like Wolves, but what do I know? The current players could raise their game, and the new ones could develop very quickly. Doncaster away tomorrow is suddenly a must win game. We, sadly, might have to finish above them this season! When we lost to Wolves back in March I felt really miserable. I believed that we were not strong enough to win promotion any time soon and suggested that the club (the board) would starve off Pardew's funding and force him to prepare for a prolonged stay in the second tier of English football. Sometimes it is nicer to be wrong when you forecast bad news. However, despite the exit of just about every saleable player this summer, and the reduction of squad size I feel more confident about our future now than I did in the week before Wolves came to town last time. Wolves are going to be a strong side this season. Ebanks-Blake looks like a real goal scorer, and Big Chris is a very competent player at this level, however, my knowledge of Wolves is not all that great. Iwelumo has started the season on fire. It would seem that if you get wingers out wide and put crosses in he will score goals. It's just ironic that we have changed our style of play this season after he left. The reading game was magnificent. The Preston game was not. Our biggest problem with the run in last season was that the team seemed to blow hot and cold. This is probably the hardest thing a manager (in just about every industry) has to cope with - consistency. I know that the style of the opposition makes a big difference, but I can accept failing to break down teams that put ten men behind the ball, but clearly Preston were a goal behind and were trying to score themselves. I have never placed too much emphasis on the fledgling league tables but I do believe that Wolves will finish in the top six this season so a point this weekend will be a good result, and a win a real bonus. Having said that I thought that Reading were going to be the real pace setters this season, and we literally took them apart. This season I think we will have more games where the crowd go hoping to win but not actually expecting it. This is definitely one of those games. Hopefully the lowering of expectations will take some of the pressure of the players and enable them to play the type of football we want to see. Is this a must win? No. Is this a game we need to win if we are going to really challenge for the top two positions? Maybe. Is a draw a decent enough result to be getting on with? Probably. If we are realistic, a top six position would be an achievement this season. I'm not saying I'd settle for that now, but if we accept the limitations of our aspirations then even a defeat at home to Wolves is not a major set back. Having said all that after the manner of our defeat last season "I would really love it if we beat them". In a week of madness the transfer window closes in a flurry of excitement, Curbishley has satisfied the bookies by being the first manager in the Premier League to leave his job, and Kevin Keegan has walked out on Newcastle, again. Sky Sports News have never had it so good, I don't remember seeing one re-run this week - it's been that exciting. What has actually happened though? Well Man Utd have continued to do what ever they want to, irrespective as to contractual obligations, FA (UEFA or FIFA) rules and regulations or moral decency; Man City have joined that exclusive club of institutions that are run out of the pocket of a rich man who has more money that he knows what to do with; and West Ham and Newcastle have raised the white flag in their war on a Champions League place. In more detail Man Utd have continued to spend money they they don't have by remortgaging their future revenues to spend the money today. I have not looked at their accounts so cannot say for sure if they are able to continue to spend at this rate of if they will one day have to pay off the loans, but for now it doesn't really matter. The way in which they conducted the transfer of Berbatov (or the way Spurs did so) has, I believe, brought the whole game into disrepute. I added the Spurs comment as we will probably never know if Spurs were using the "Man Utd do not have permission to talk to the player" comment for their own personal ends. The suggestion is that Man Utd payed a higher fee (blood money) to buy Spurs' silence. It could, in reality, be any number of things; keeping fans appeased, making the player out to be the bad party, the list goes on. One thing that it does signify is that Spurs have had to accept that they are not in the same league as the top four. What ever the 'reasons' are they have now lost Carrick, Keane and Berbatov to the teams that have Champions League Football and in so doing have massively reduced their chances of getting it themselves. Man City are a revelation. I was quite enjoying seeing Shinawatra go under and was looking forward to the first lesson being learned about the horrors of foreign investment. I actually quite like City, well I don't hate them. I am certainly looking forward to seeing Man Utd being humbled by their rivals. Their splash in the transfer market for Robhino looks like a rushed gamble, but if you are worth billions £32.5m plus wages is a drop in the ocean. What interests me much more are the shenanigans that took place at both West Ham and Newcastle. If we put aside the emotional interests in Curbishley being involved with Charlton for so long, and the irrational belief on Tyneside that Keegan in the saviour there seems to be a consistent thread. It was not that long ago that Newcastle were a top four side themselves, 4th in 2002, 3rd in 2003 and 5th in 2004. Bobby Robson was well past normal retirement age and not in great health, but was pushed out the door in a disrespectful fashion - not something that surprises me about Newcastle. Since then they have been nowhere near the Champions League, and this at a time when it was most financially beneficial to be involved. Sam Allardyce was brought in to turn Newcastle from a glamorous team to a winning, functional team. He lasted eight months. It was clear that he either had to play lovely football or start winning immediately. January 2008 and the return of the Saviour. I have no idea what conversations Keegan had with Ashley before he came in, but there was speculation that the only reason he didn't spend £50m in January was that the transfer window closed too quickly. This summer Newcastle have spent nothing like that, and Keegan has gone. The justification for his departure has been put down to a lack of being able to manage, but either way it is clear that there was not £50m available to spend on players. West Ham are a slightly different situation. Richard Murray suggested in June that the owners at Upton Park had run out of money, and from the little interest I have had in them this summer they have, like us, been net sellers. Curbishley is not the best wheeler dealer in the transfer market, but he makes few howlers. The signings he made in January 2007 were all over price, the wages were all way too high, and none of the players could be off loaded for what was paid. However, it is not easy to sign players when you are in trouble and desperate. It is not helped when you have a new Charmian that is bragging about how much money he is going to throw at it. Thus I would say that Curbishley, by avoiding relegation, can be excused those signings. Last summer Curbishley over spent on several players, but he was still working under a regime that was aiming for Champions League football and 'had money to burn'. The players did not manage to achieve what you would have expected from that level of investment, but 'Rome wasn't built in a day'. Clearly there has been a change in the thinking at West Ham, and even though I don't want to get bogged down with the day to day events it is clear that they no longer genuinely aspire to a top four finish. The balance of power in English football is changing. Arsenal are the only club in the top four that are not owned by 'foreigners' and they could well be the most at risk if Man City are going to step up to the plate. Newcastle and West Ham have both had significant injections of capital in recent seasons yet both have now at least postponed their drive for the Champions League. It suddenly makes our summer seem a lot less depressing and our sabbatical in the second tier of English football much more palatable.